World 1 | New Super Hacker Bros.
06.01.2011 – Added rain to the game. 08.01.2011 – Decided to start a hack togehter. Inserted puddles, Grassland Wii tilesets and rainy BG. Started with W1-1. 10.01.2011 – Started with W1-2. Worked on the Grassland tileset. Finished W1-1. Added underground Wii tileset. 13.01.2011 – Started with W1-Tower. Added Tower Wii tileset. Finished W1-2. 14.01.2011 – Added “GO BEHIND TILES”-effect. Started painting a shy guy and inserted it into the game. Worked on W1-Tower. 16.01.2011 – Finished W1-Tower. Debugged W1-1 and W1-2. 22.01.2011 – Debugged the jyotyu palette. Started with the End-of-level-castle in the Wii style. 23.01.2011 – Started with the Mushroom tileset in the Wii-style. 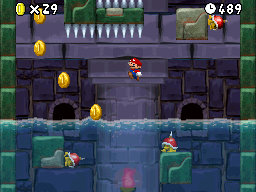 24.01.2011 – Inserted the Mushroom tileset into the game. Started with W1-3. 25.01.2011 – Fixed the Mushroom tileset bugs. 27.01.2011 – Finished the Mushroom tileset. Worked on the shy guy graphics. Fixed the end-of-level-castle bug. 30.01.2011 – Worked on the shy guy graphics. Worked on W1-3. Worked on 1-Airship. 31.01.2011 – Started working on a new Tileset. Worked on W1-Airship. Finished a new Tileset. 02.02.2011 – Compressed the Mushroom Wii tileset. 03.02.2011 – Worked on W1-Airship. 06.02.2011 – Compressed the Mushroom Wii tileset. Worked on W1-Airship. 08.02.2011 – Finished Leaf’s with a silly bug. Worked on W1-Airship. 10.02.2011 – Worked on W1-3. Worked on W1-4. 11.02.2011 – Worked on W1-4. 12.02.2011 – Worked on W1-3. 20.02.2011 – Worked on W1-4 and W1-Airship. 25.02.2011 – Worked on W1-4. Finished the Shy Guy Texture. Fixed a jyotyu-bug. 26.02.2011 – Finished W1-4. Fixed some bugs. Finished 1. Beta-Trailer. 28.02.2011 – Started with W1-A. 14.03.2011 – Worked on W1-A. 19.03.2011 – Improved the Underground-Tileset. Adapted W1-2 to the Tileset. Adapted W1-A to the Tileset. 20.03.2011 – Finished W1-A. Finished W1-Bossbattle-Tileset. Finished new W1-Bossbattle. Started with W1-Castle. Finished and improved W1-Castle Tileset. 21.03.2011 – Worked on W1-Castle. Started the Forest-Tileset. 24.03.2011 – Finished the desert Tileset. Started with the Pyramid Tileset. 26.04.2011 – Worked on W1-Castle. Got 3 new “GO BEHIND” 32×32 pixel tiles. 06.06.2011 – Edited Grasland Tileset.